Say it with us: Stawp it, Rahn! 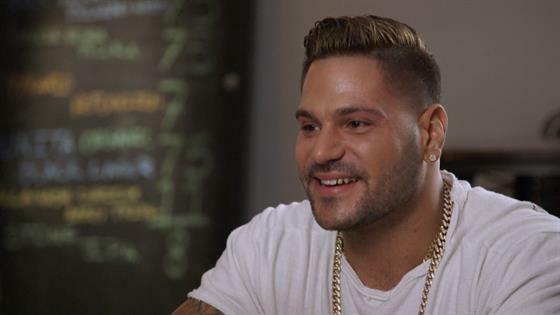 After the first trailer for Jersey Shore Family Vacation was unleashed and teased Ronnie Ortiz-Magro possibly cheating on his at-the-time seven-months pregnant girlfriend, we prayed to the GTL gods that it was a fake-out in the name of making dramatic TV. Alas, we held a cast member from an MTV reality show to a too-high standard, as Ronnie seems to have cheated on Jen Harley at the end on Thursday night's episode, despite some warnings from his fellow co-stars. Once a creep always a creep, we guess? Ronnie, 32, and Jen welcomed their first child together earlier this month, and recently revealed her name: Ariana Sky. "He's over the moon," a source told us of Ronnie's first weeks of fatherhood. "Words can't describe the feeling. You live your life not ever really knowing the meaning of true love until you have a child," Ronnie wrote in an Instagram post. "True unconditional love. You love your Significant other, you love your family. I have to say I understand when everyone said you'll understand " when you have a child of your own or when you become a parent" I know I have still tons to learn but im excited for this new journey & chapter In MyLife with my beautiful girlfriend & my Daughter." But how did Ronnie's Miami hookup go down on the show? Well, the roommates go out to a club together, and Jenni "JWoww" Farley saw a blonde woman she thought Paul "Pauly D" Delvecchio would like...only for Ronnie to start talking to Antonia from France instead, with Mike "The Situation" Sorrentino astutely noting, "Single Ronnie is in the building." And he wasn't the only roomie to note Ron's actions. "Ronnie is full-tilt right now. He is a wrecking ball," Vinny Gaudagnino said of Ronnie's behavior at the club. "If Ronnie gets any closer to this girl he's about to have a second baby mama." Ronnie went on to invite Antonia and her three friends back to the house, with Nicole "Snooki" Polizzi warning him, "I love you, but this looks bad." Instead of heeding his friend's warning, Ronnie proceeded to get in the jacuzzi with the women, later telling Antonia, "You're beautiful. You're gorgeous. You're going to get me into a lot of trouble." The episode ended with Ronnie giving Antonia a tour of the house, ending up in his bedroom with the door closed. Kissing noises soon followed. Soon after, Pauly D knocked on the door, looking to give Ron some water, only to be told, "No, thank you!" Earlier in the episode, some of the roommates questioned whether Ron was even over former girlfriend Sammi "Sweetheart" Giancola, the only original cast member who chose not to return for Family Vacation to "avoid potentially TOXIC SITUATIONS." Their relationship ended for good after Ron admitted to cheating on Sammi (again). "Ron needs to stop talking about Sam and like move the f—k on," Deena Cortese said. "Sam told me that he used to call her on blocked numbers and used to be like really weird. She was afraid she was going to get in the house and he would get drunk and spiral and try to get back with her or something." And when asked about how he would've reacted if Sammi, who is now dating Christian Biscardi, had decided to return, Ron simply said, "I have a kid on the way, you think I give a f—k what she does?"